The clients were interested in a more organic design, utilising adobe materials to create an intimate courtyard area with a twist, that could be used during the day and night. The existing brick floor needed to stay. The concept of the 'Garden of Eden' was created with mosiac highlights that included imagery of Adam and Eve. 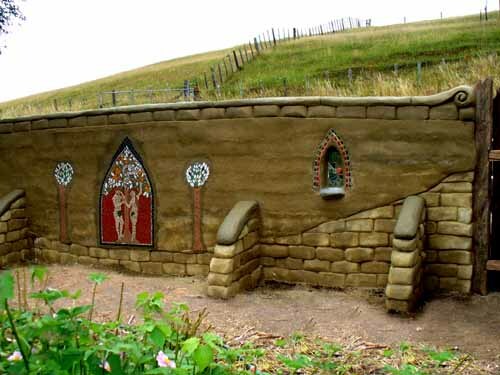 The adobe walls not only blended in with the rural landscape, but also provided privacy and wind shelter and had a quirky element of sculptured lizards seemingly running along its surface. Old weathered fence pailings were also creatively incorporated into its design. At night the courtyard space was transformed with wall alcoves containing candles to provide a sense of warmth and ambience.